2019 !!! LETS GO !!!! Like a red large curly 'big papi' pube, this thread will have plenty of lengthy twists with the odd surprise stuck in between. For new people I will post how I go each week, try and give some insight into my trades for the week and post anything else I can think of. I will edit quite a bit on the first few posts as I go, it is helpful for me for brainstorming ideas and recording information but happy for all to see. About myself, I am just an average early 30s kiwi bloke who lives in Sydney,follows the Sharks and have played this game for many years. Every year I have had this fantasy about having a team full of hookers. Unlike in my real life, the wife has no say in this Fantasy. Basically relying on base stats over attacking stats and with the emphasis on less downtime (penalties/stoppages) should mean more tackles and perhaps more darts out of dummy half (Tired forwards). Most gun hookers on average have a very low floor due to high base stats so you should get good stable scores from your guns to start with and allow you to pick up value players in other positions. By spending a large amount of your cap on these high priced players should result in good points, so in reality you want them to be stable too. So less emphasis on boom bust players that start poor and bleed cash due to low minutes, have a slow start or poor form due to other mitigating factors. With grabbing them later you can cherry pick the effected ones for a cheaper price and fill in the gaps in the team as they become available. See if you get your gun picks wrong early it can be hard to fix too and you are playing catch up all season, needing cash for other fixes while they drop in price each week tempting you to trade them out. You only get 2 trades a week early on too, so how do you fix these positions, bring in the right cows and then throw in injuries and suspensions.... You just don't get enough trades full stop so take away this scenario. Back in the day you stacked your bench with cows, so why not stack the bench with potential year long keepers? Regardless of players 1-17 you get the same points regardless of where they are. So this should result in removing most of the risk of starting with a poor gun or getting stuck with under performing ones . Should also give me time to see their form, pick up the fallen guns in a few weeks time if they are benched or start badly (ie Crichton) allow me to ride the cows up to them. This will put more risk in the cows performing, but the fact a lot of people are playing them to start the year, it is mitigated if they do score bad. On the slim chance all these boom/bust player fire then you are probably chasing the pack, but the hardest part of preseason is knowing which gun will fire/fail so people usually end up with a few misses. Starting with a weak WFB, you are paying for pts per $$$ . If they can score 80 points combined they will do the job.You have paid for 52pts remember and nothing feels worse than a mid range or gun back scoring 20. With the way Fantasy works too, you can't afford to jump on a bottom priced cow late otherwise you miss out on all value so having lots means I should be covered. Again I will focus on cash generation from cows with good timing to fallen guns or value picks as they become available and play them alongside the mid rangers (ie Tolman/Morgan/Capewell). I don't want to be making knee jerk trades early (by paying top dollar for players) as that means more cows you have to find to pay for the rest of your team. 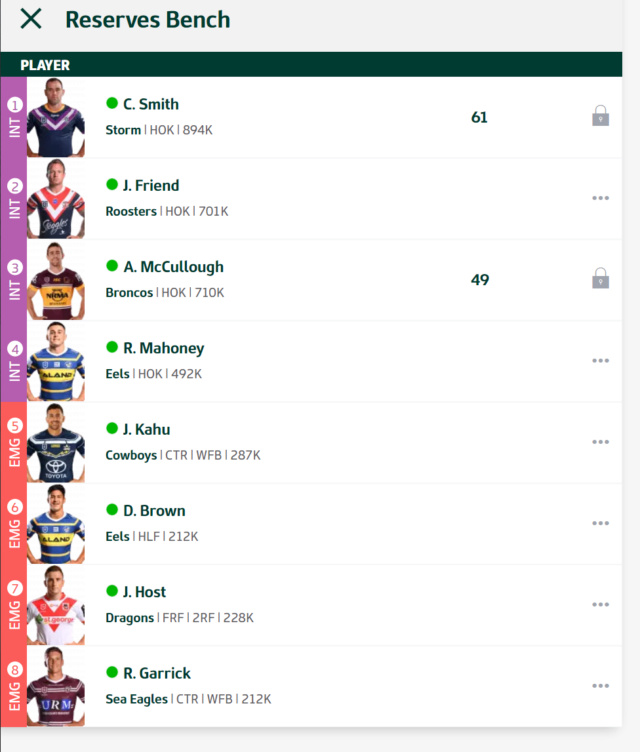 The sooner your final team comes together the better as well so kill 2 birds with one stone (Or one big jack bird with one stone). Paying for stable captain scores, the best player in 2018 and highest scorer and a good chance of doing the same this year. Can't see him dropping off in 2019, is a vital cog in the Rabbitohs attack and plays 80mins. While he may not always have the highest score each week, his floor means you won't lose out either. Due to the player ownership and his price, will start with him as he is an easy swap out for a better cow if he fails. The main difference between the years is his errors, so if he can cut this down then we may see those better scores. He should get decent minutes and was their big off season signing, but who knows how he will actually be used. Though he had a couple injuries and playing through it in Origin resulted in a poor end of the year for his earlier pedigree. He is worth starting with and should score well, at worst he is a keeper in the 2rf and that says something. Big year ahead Cameron, really stepped up last year but due to the pack he had limited minutes. Now with Crichton gone and a pack reshuffle, finally gets a chance to make it how own. Should get a month or 2 in the role if he can play well and make the position his own maybe longer. Capable of a try he is a great line runner, though watching him play hewill probably need attacking stats to push his average higher. Depending on his halves partner he will gain all the kicking duties too, so potential to score even higher with higher base stats. Big frame for a half and out of 'that' Penrith side that killed it in u20's. Played ctr there so has a decent running game along with a big boot. Big wraps on the kid, junior kiwi and a solid year for the jets means he will be given a shot on the edge for the sharks to start the year. He was a great edge runner last year and can hit a gap, (ala Lewis) and has also been working with him in the offseason so don't be suprised if he can emulate his mentor. If he can start at 2rf then he is great value and a great pick up. This helps us see the bigger picture and see what he is capable over 80mins on the field, 15pts underpriced if he plays 80 which he is capable of in Lewis's old role. Given it was mentioned that players were moved to accomodate him at ctr, means it is his position to lose. Big and strong Fijian so capable of breaking a tackle or 2. If he can jag a try or 2 then the price rises will allow me to ride him up to a keeper. The old master, should steer the team around all year and rack the points up without any real effort. Every year you think his scoring will go down and he still maintains the gun scores. He just has those high ceiling scores that you reliably get those 50+ each week. When he gets the minutes he scores well. He is hoping to play 80 this year but even if he gets 65mins + he will make cash. Junior Kiwi and starred in the trial games. More of a runner than controller so will play second fiddle to Moses. Though he is quite elusive so if he can make a few breaks. he will be reliant on these to score well this year. For his price and potential, he is a no brainer to start with and put pressure on Keighran's spot in the 17. Out of the Dragons system, solid but not spectacular career in nsw cup and juniors and in a Manly team that may struggle this year. He has a big frame so might be able to break a tackle or even jag a try, medium job security but who knows with Hasler and a full strength team. Brought in as cover for WFB, starting fullback and goal kicker in what should be a good team this year. Questionable base stats and injury plagued career though only needs to score above 19pts to make cash. Bottom priced player, ok fantasy player but is one of those players that plays well just needs the game time. Has been around the dragons a while just has struggled to crack the team with their stong foward depth. I look at this game that everyone will end up eventually in the season with the exact same team. Its how fast you generate cash and how early you assemble that team with smart trades that dictates where you finish. The same reason you still see talk of people finishing their team with late trades in the last few weeks of the game, it's too late and the impact is minimal. It's also not the POD's that get you in the mix, who after a week or 2 you can grab regardless. You don't need a perfect team either to start the season either, but if you get it massively wrong then you are playing catch up all season just plugging gaps. So a 'POD' team is bound to run out of steam quickly and while you may nail some, you are bound to get just as many wrong and thats where you lose points to the majority. Why do that to yourself when you can pick a safer team to start ? Take a popular cash cow to start the season. It was different back in older versions of the game or in say super coach when you get a couple weeks of looks to make a call. If they fail then you pick a new one up later and you haven't lost much. Last year i traded in Dufty thinking he was worth a shot and given his low ownership was worth a gamble as a POD. I watched his games, did some research and rolled the calculated dice thinking I had made a smart bet on someone while being up and down he was going to go large for me. It only took me that first weekend watching the game to realise what I had done and regret sunk in. His involvement was hugely reduced and barely touched the ball and you could see it was a strategic change by the dragons. While I could have simply done nothing and hoped for him to change, the following week I cut my losses and traded him by bringing in Thompson. Cost me a trade and Dufty killed it that week (fluke) to rub salt in the wound, but in the long run I trusted my eye and moved on. It was a ballsy move but he turned into one of the biggest earners all year and probably saved me my season. 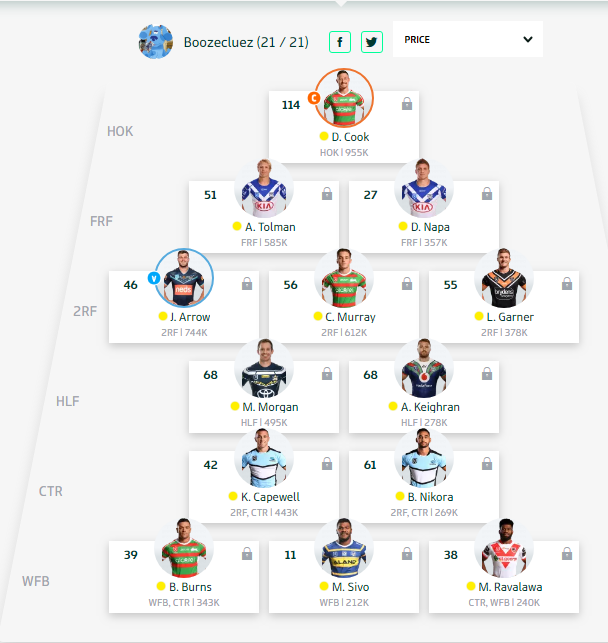 Dufty was a POD and who I felt was the 'safer' pick but in hindsight I should have gone with the more popular Thompson from the start who I had been considering also. I mean I had even talked him up and at one stage had him in my team to start with but still didn't bring him in. Using another example of last years autopick team competition (where all teams started exactly the same) the end teams value and results massively fluctuated. Sure some mucked around, gambled or didn't take it too seriously but it does give some insight into how important it is to fix your team early and generate cash. You could say it is a microcosm of the game we love, and how important it is to make smart trades by cutting your losses, bringing in the right players and avoiding traps. 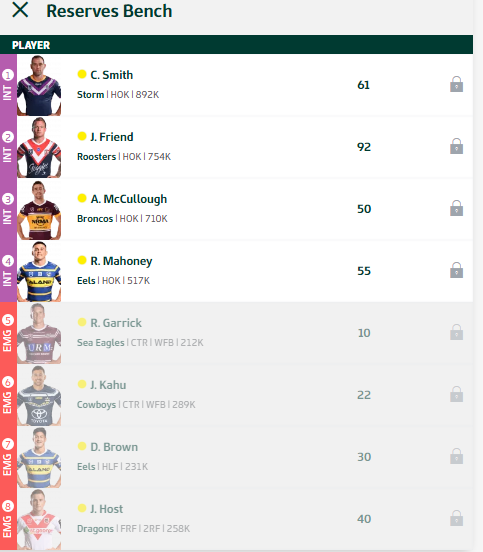 An example in that comp was we all started with Thurston who I got rid of very early to fix other spots, while some held onto all season where he bled cash and scored terrible. Given spare cash was low and we were missing some popular guns/cows then some tough calls had to be made early. I think knowing when to trade is sometimes far more important than who you are trading out. Anyways just some insight into my thoughts, bit of a novel but was in the mood and wanted to share it for anyone interested. What did you Google to find that Nofo piccy? That is awesome! @SI wrote: What did you Google to find that Nofo piccy? That is awesome! 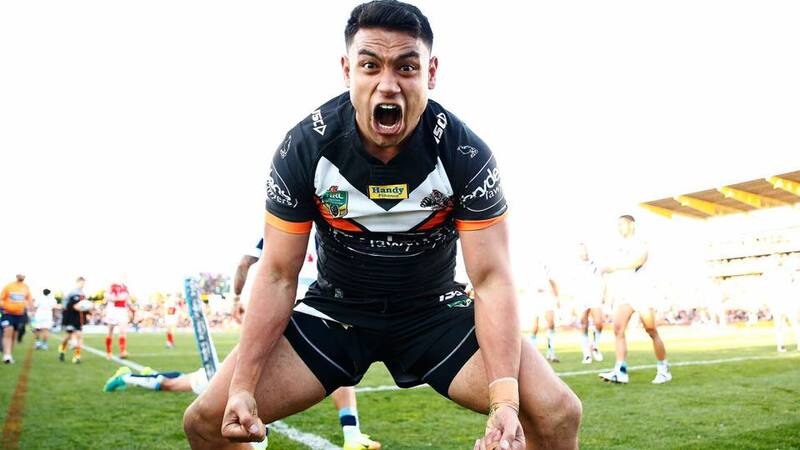 I searched "David Nofoaluma reacts to Boozecluez winning NRL Fantasy"
Im tossing up between keeping Radley on my bench or downgrading and grabbing Teddy. Edited: So completed changed the team and strategy so will be interesting to see what would have happened If i stuck with the original team. It would probably have been similar to the fanatics celebrity team with a few players like Gillett and Tedesco there. Booze you only have 20 players listed? Fair enough, can only think the similar teams are a good things and shows people are in the right path here. The fanatics team will be tough to beat this year too and it shows how different it is compared to some of the Facebook groups teams are. Hi Booze, this side must be doing great this weekend. What are you on? @mattnz wrote: Hi Booze, this side must be doing great this weekend. What are you on? Kahu only came in late and was there as an insurance policy. Great start mate. The only disappointments would be Napa and Sivo. 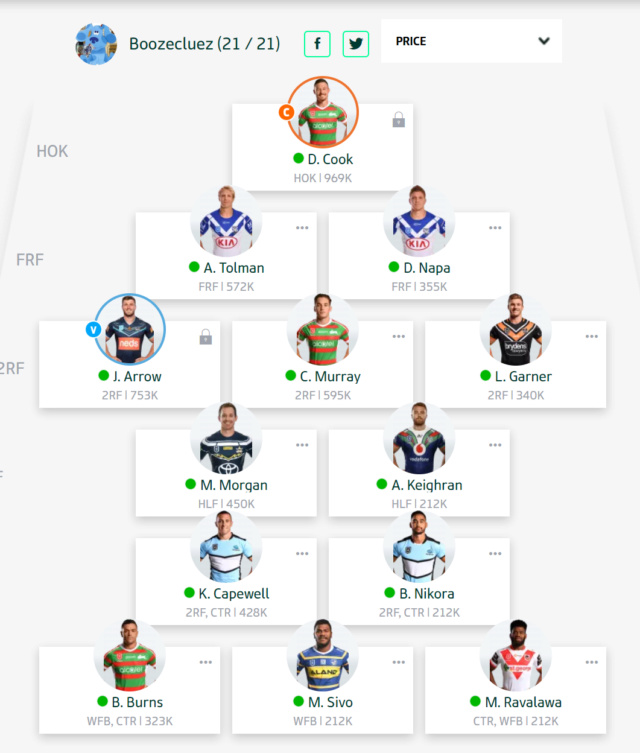 Would you look to give them one more chance since the Dogs are playing the Eels this week and either or both could go well or look to grab the missed cash cows like Lawrie, Burr, Mikaele etc? @Pacey's Best wrote: Great start mate. The only disappointments would be Napa and Sivo. Would you look to give them one more chance since the Dogs are playing the Eels this week and either or both could go well or look to grab the missed cash cows like Lawrie, Burr, Mikaele etc? Lawrie looks good to start for me in place of Napa so will bring him in. With a big score and high ppm then he only needs minutes and he should bang out decent scores for a while. Think Napa gets traded out as will probably make coin too slow now and need that burst that Lawries 50pt start does. Host is a handy reserve due to his dpp. Going to play Sivo again as well, he had a chance to score a try but was ruled back for the high shot and had another break they ruled a knock on but that was a dubious call. So the second trade I will look as a pure cash generator regardless of position I think to leave in nprs. Due to the dragons pack being low on numbers, he got more game time and banged out a big score so from here he really only needs minutes (Which he should get). When the reinforcements come back he should move to the bench worst case where he can still score as proven rd 1,but for now enjoy the ride. Purely from a cash grab point of view, looks to make 100k over 3 weeks from 35pts alone.